To create a Video DVD that plays in a regular DVD player, you need some software that converts your raw video clips into titles, chapters, and menus, using a specific file structure that a DVD player can understand. When Would I Need Authoring? If you want your video clips to play in a DVD player, you need authoring software as opposed to just burning raw video files (.mov, .avi, .mp4) to a data DVD (which will only play in a computer or modern device). TrepStar does not offer blu-ray authoring or duplication services. No menu. The DVD will be set to auto-play so it starts to play when inserted. Basic single menu with just a "Play" choice. Basic single menu with a "Play All" plus options to select any scene/chapter from that single main menu. Two part menu with "Play All", and "Scenes" choice. Choosing "Scenes" brings up the second sub menu. The wording can be changed (chapters or chapter selection or menu or whatever name you choose). We don't offer more complicated menu systems. Choose whether the DVD will auto-play or not. By default, we set DVDs to auto-play which is what most people want. 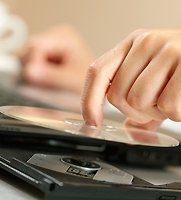 Auto-play means the DVD will start playing when put in a computer or DVD player unless that device has auto play turned off. Up to 9 chapters. We can split your video clips (e.g. .mov, .avi, .mp4) into several chapters, or combine short clips into a single chapters. Any more than 9 chapters makes the menu too complicated unless it becomes just a simple text list. If you want more than 9 chapters, each extra chapter costs $25.00 each and the chapter list will be a simple text list on one menu. We can take any artwork you have for the background or menu system. Just send some HD .jpg images and we'll try to cut/paste them into a menu. If you don't have specific artwork already made for the menu system, we can take a screen grab from your video (which is most common). We can adjust the font and color of the menu text. Total play time up to two hours (120 minutes or so). We author single layer DVD-5 4.7GB DVDs. Basically, this means it's usually no more than 120 minutes long for all content included on the disc. Menus and artwork take away from total play time because they are stored on the DVD as well so the total playtime can change based on that. We will author the DVD, give you a link to an ISO file that you download to make sure it's what you want. Your computer can play an .iso file. We'll show you how. We will make a few adjustments (iterations) if you see any problems or issues with the authored DVD ISO proof. If we have to keep going back and forth with changes, that really adds a lot of time, but usually, we get it right after the first or second try. If you want more than two iterations in the design phase, we charge $150.00 per hour for that extra work (we'll let you know before we bill you). It takes about an hour to redo the video so each change is roughly an extra hour. Once it's done, you'll have a free TrepStar DVD project in case you want us to manufacture and ship DVDs to you or your customers. You don't have to use TrepStar to publish your DVD. We just offer manufacturing and fulfillment service if you want it. Of course you also get the final DVD .ISO file that you can use to create your own DVDs. This price is for either an NTSC or a PAL version (see more on this below). If you need both, it costs $75.00 extra per disc. If you're interested, send us an email with some of the details. Once you have your video content created and edited, if you want to make it playable in a DVD player, you must convert it to DVD Video format using DVD authoring software. As you know, a DVD often has menus, and sub-menus with buttons such as play movie, scene selection, deleted scenes and so forth. Creating these menus, background art, buttons, and other artwork are part of the DVD authoring process. Even if you just want your clips to play with no menu, you still must author the DVD. The process of DVD authoring combines your video clips with artwork, menus, chapter points, text, and possibly animation, music, and more. DVD authoring is the final step after you've created your videos. Once complete, it may be viewed on a DVD player, bluray player, game system or streaming device. A video/movie DVD playable in a standard DVD player has a specific file structure and screen resolution. DVD players are NTSC (mostly North America) or PAL (mostly Europe and Asia and the rest of the world). This is not to be confused with region coding which tells the DVD player what content it is allowed to play. We author our DVDs region free, meaning it is allowed to play in any region. However, the NTSC or PAL format determines which systems can actually play it correctly. If you play a region free PAL DVD in an NTSC DVD player, on some systems, it may look jittery, and have skips etc. This is because of the format, not a region restriction or a bad DVD. The main differences are frames per second and scan lines. This depends on the country where the DVD player is located. When authoring the DVD, it can be produced as NTSC or PAL which have different resolutions and frame rates. This is set within the authoring software. TrepStar authored DVDs are region free, but you still have to choose between NTSC or PAL. 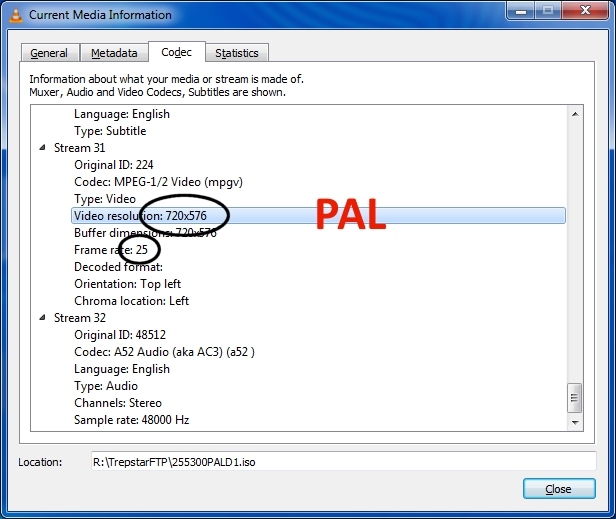 Computers can read and play both NTSC and PAL DVDs. DVD players in America play NTSC DVDs and often have trouble playing PAL DVDs even if they are supposed to be region free players. Most of the rest of the world can play PAL DVDs and those players often have no trouble playing region free NTSC DVDs too. However, since some PAL DVD players will have trouble with NTSC, you need to decide if you want to author both an NTSC and a PAL version. If you're not sure, author a region free NTSC version which plays in America/Canada, and often in other PAL DVD players. There are no guarantees with that however. The reason there are two formats is because TV technology evolved differently in different parts of the world. TVs in North America and Japan have different resolution than TVs in Europe and Australia which is the main reason there are two types ways to author the DVD (NTSC vs. PAL). If you just need your video clips to play on a computer, you may just burn them as files. This is considered a data DVD. Doing this is not considered DVD authoring. You are simply burning files to a DVD (or USB). There are no play all or scenes menus or artwork. 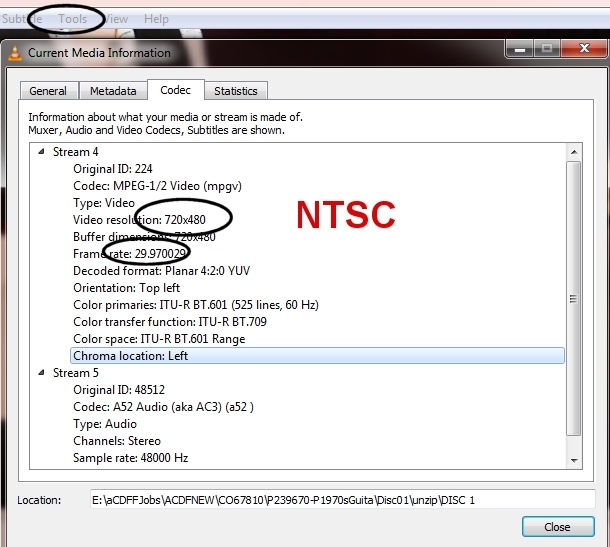 Open your .iso or VIDEO_TS folder with VLC media player and check under Tools-Codec and find this information. You may have to scroll down a while to find it. The following example is from an NTSC coded DVD. We author the DVD region free, but you have to pick the NTSC or PAL format which sets the resolution and frame rate. Some DVD players/TV systems may be able to play region free content, but not able to play PAL or NTSC format. Plays in USA and Canada (North America) DVD players and computers. Often, NTSC DVDs will play OK in other region DVD players and TV systems but there is no guarantee. e.g. It has been widely reported that many PAL DVD players and TVs can play NTSC DVDs. The DVD player and TV must be able to play the NTSC format. Video resolution: 576i or 625 lines. Plays in most countries OTHER than USA/Canada. Most USA/Canada DVD players and TVs have trouble playing PAL DVDs. We prefer to get source files in mp4 format. These should be compressed a reasonable amount. We don't accept more than 15GB of source files per DVD since it will not make the final video look any better if the original files are larger. If you have a .m4v video convert it to mp4. As long is your .m4v does not have Apple's optional DRM-encryption, you can just rename the file extension to mp4. If it is encrypted, we can't accept the m4v because it's copy protected and we can't copy it. DVD authoring describes the process of creating a DVD video that can be played on a DVD player. DVD authoring software must conform to the specifications set by the DVD Forum group in 1995. The specifications are complicated due to the number of companies that were involved in creating them. Strictly speaking, DVD authoring is a separate process from MPEG encoding, but most modern DVD authoring software have a built-in encoder (though separate encoders are still used when better quality or finer control over compression settings is required). In addition, if your source video is HD - 1080p (1920x1090 pixels) or 4K (4096 x 2160 pixels), it is at higher resolution than a standard NTSC DVD which is (720x480). If you have very high resolution source material, you may not want to downgrade it to a DVD format. You may be looking for bluray authoring which is beyond the scope of this document. You may consider a USB Flash Drive product instead.